CEC offers a full line of semi-automatic stretch wrap machines. Focusing on quality pallet wrappers at an excellent value in the marketplace. Our machines are designed to provide increased packaging efficiency and wrap consistency. They are ideal for companies that need to add capacity to their packaging system especially if you are currently hand wrapping pallets and skids. Below you can find more information about our current lineup of machines and decide which will best suit your packaging system! Why Use A Stretch Wrap Machine? Pallets are mainly stretch wrapped in order to protect them from damage during transport by effectively unitizing them. Pre-stretching the film 250% without neck down before it’s applied to your pallet load increases the tensioning forces that are applied to the load to a degree that can only be achieved by our uniquely built X-Stretch, pre-stretch film carriage. The variable speed, power pre-stretch rollers provide automatic corner compensation for a consistent film tension. This provides more flexibility than our competitors whether you’re wrapping bricks or empty PET bottles! Our stretch wrap machines and systems feature a variety of programmable wrap parameters to apply exactly the amount of stretched film that your load requires. Because they are machines, they will run for hours without getting tired where we humans will be far less precise after just a few pallets wrapped. Our pallet wrappers can also pull tricks that others or human operators can’t. For example, All our wrappers will wrap your pallet load all the way to the ground and some models can also rope the film to create a stronger product to pallet lock. Stretch wrapping is the last step of your manufacturing or distributing process and you want to be sure it’s done fast and well. Wrap time will depend on several factors such as load size, stability and quantity of film applied but on average 1 minute is all it takes to perform a wrap cycle. Comprehensive yet user-friendly operator interfaces also contribute to getting you going faster. Many dangers such as back injuries, hand burns and collision due to employees walking backwards while hand wrapping are completely eliminated with a stretch wrap machine or system. Safety is paramount and providing user safe equipment is of great interest to us. We are one of the very few that use steel only when fabricating covers and shields to protect from moving parts. There are no cracking plastics here! Taking the physical effort out of the equation means that operators remain more alert and efficient to get the job done. This also opens the door to greater multi-tasking that is far more valorizing for the operators. Grow your business without increasing labor costs. Pre-stretching means actually stretching the film before it is applied onto the pallet load unlike stretching it while applying it that results from hand wrapping or using a machine that does not have a pre-stretch film carriage. If you’re wrapping 10-15 pallet loads every day then a wrapper with the X-Stretch film carriage is the appropriate choice. Because we value good sense, most semi-automatic machines and all fully automatic systems come equipped with our unique X-Stretch film carriage that stretches film to a standard ratio of 250% with minimal neck down. This is the most cost-effective technique to safely unitize pallet loads. When you take the step from hand wrapping to machine stretch wrapping, you instantly reduce film usage. In addition to the dramatic 50% reduction on average of film expenses you’re also making a sustainable choice by reducing your carbon footprint. When was the last time you actually saved dollars by taking a sensible decision? Why Do We Stretch Wrap? Before the stretch wrapping process can begin a load must first be assembled on a pallet. Once the load is on the pallet, the whole ensemble (pallet and load) is stretch wrapped together. Assembling the load on the pallet is an important step, however. Load placement on the pallet is important (the load shouldn’t overhang the sides of the pallet or be more than four inches inboard) and the pallet itself also plays a rule (pallets should be in good condition). It is important, when stretch wrapping, not to skip steps that secure the load the pallet. As the load is wrapped, one option is to wrap the pallet with the load. This, however, runs the risk of punctures from forklifts or pallet jacks. When punctures occur they introduce the opportunity for the puncture to propagate, causing loss of containment force, and increasing the risk for load failure. This is one of the reasons we invented pallet grip. The bottom few inches of the film web are automatically rolled into a tight cable. The cable is driven down below the top deck boards of the pallet, leaving enough room to clear forks (avoiding the puncture problem) while still being tight enough to lock the load to the pallet. However, even stretch wrapping processes that use pallet grip or other securing (locking/bonding) measures won’t prevent loads from shifting during transport. Bonding a load will keep the bottom of the load and the pallet joined, but the top and middle of the load could still shift out of plumb. However, the load/pallet bond will reduce the risk of the load sliding off the pallet. There are three methods of stretch wrap application: manual, semi-automatic machine, and high-speed automatic machine. Manual, or hand wrapping rely on workers to, as the name implies, manually stretch wrap a load. A worker secures the film to the pallet and then manually wraps the film around the load starting at the base of the pallet. Manual wrapping tends to be physically demanding (imagine the awful dizzy feeling in a hot warehouse), and generally has the highest material cost (since there’s no substantial pre-stretch) and makes it difficult to control for specific containment force. 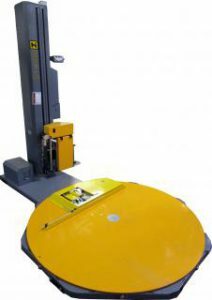 Semi-automatic stretch wrappers come in a couple of forms (turntable and straddle being two) but, in general, the load is placed and the machine performs the stretch wrapping. 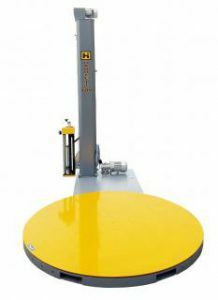 This is accomplished by either rotating the pallet as the film moves up and down or in the case of a straddle style machine, rotating the film around a stationary pallet. High speed automated stretch wrappers are similar to semi-automatic styles in that a machine performs the actual stretch wrapping of a load. However, automatic stretch wrappers typically include conveyors for infeed and discharge to automatically cycle loads through the machine, as well as apply and cut the film. There are actually a number of features that can be added to certain semi-automatic machines that offer some increased automation. For instance, automatically cutting and clamping the film, and a remote start lanyard, allow fork truck operators to remain safely buckled in their seats on the trucks even while wrapping loads on a semi-automatic machine. For an overview of the entire continuum of machine wrapping solutions, check out this page which lays out choices in order of increased speed and throughput capability. That’s actually the critical factor to consider – how many loads/day may not capture the surges which often occur late in the day as shipments are picked up. So loads/hour is an important factor. No matter which type of stretch wrapper is used, containment force is the most important things to get right when stretch wrapping. Containment force can mean the difference between a load arriving at its destination intact and arriving damaged and unsaleable. So what is containment force? Containment force is what holds the load together. Officially, it’s the wrap force times the number of film layers. Wrap force is simply a measure of how tightly a film gets put on the load. Film layers are the number of wraps applied to a load at a specific point. No matter how you arrive at a loads ideal containment force, the most important step is always measurement. Measuring the containment force at consistent intervals (we suggest once/shift for most operations), evaluating results, and making adjustments is the best way to find the containment force that works for you. The most advanced high-speed automatic stretch wrappers actually verify every load has the specified amount of containment force. Automatic Stretch Wrapper Model 1100AAC stretch wrap machine offers top-of-the-line functions and features at a great price. It enables you to perform the entire wrapping cycle without getting off of your forklift. Standard features on the 1100AAC include a remote control with auto film attach, hot seal, and cutoff, 250% powered pre-stretch, user-friendly PLC control panel, braked turntable, and many other elements cleverly designed to make this unit a must-have in any facility looking to improve and streamline their packaging operations. Max average loads wrapped per day 300 cycles. Model 600 offers all the features and functions you need at an unbeatable price! It is ideal for those who are looking to upgrade from hand wrapping their pallets and need to increase their capacity and improve wrap consistency. The 600 pallet wrapper has a photo eye to automatically sense the height of the pallet load and has multiple cycle parameters and quick select features that no other machine has at this price level. 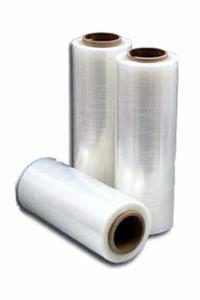 It is important to use the correct type of stretch film in our stretch wrap machines. There are many different manufacturers and types of stretch film in the market. You must use machine grade film in our machines or you will most likely see poor performance and film tearing. Hand grade films are not made to withstand the tension and stretch that a machine can put on the film. Our machines require 20” wide machine grade film to feed through the carriage rollers properly, you can you narrower film but 20″ is the most common. Film is classified by the gauge or thickness of the material. For our power pre-stretch models 850PS and up we suggest an 80 gauge or higher equivalent film grade. This will help reduce the chance of tearing as the film is extruded through the powered rollers. The type of pallets and product you’re wrapping along with the speed and tension of the film all play a role in the quality of the wrap and the risk of film tearing. We are happy to make a suggestion on the best film choice for your operation. Sharp edges, speed, and film tension level all play a role in the quality of your wrap and the chance of having the film tear. You can reduce cost by selecting the best film gauge for your operation. By selecting the right film you reduce wasted film (too many revolutions), reduce the chance of tearing, and reduce overspending on too thick of film that can be costly. All things that shorten the cycle and reduce wasted material.